We work closely with transportation companies to ensure the safe handling and storage of dangerous goods. Our fully compliant lubrication stations, chemical storage cabinet, outdoor relocatable containers, gas cylinder stores, bunds and outdoor miniseries cabinets are ideal for preventing costly accidents, explosions and fires in the transport industry. We design and manufacture a wide range of customisable products for storing and handling all flammable liquids, acids, bases and gas cylinders used to service or clean vehicles. The most popular dangerous goods classes for transport providers are listed below. Choose a class to view all relevant products. The STOREMASTA® Contractor Security Storage range features lockable, heavy duty vehicle storage boxes. These boxes are ideal for tradespeople looking to securely store tools on worksites or in vehicles. 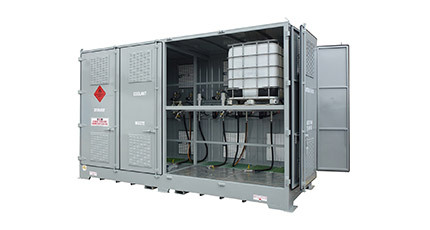 Relocatable, bunded DG storage containers are suitable for storing dangerous goods outdoors. STOREMASTA® relocatable chemical storage containers are designed to increase storage efficiency and safely store volatile materials outside. Our end-to-end risk assessments are a great way to guarantee that you are complying with Australian regulations and are not liable for any spills, explosions or fires which occur during dangerous goods storage or handling. Walk away with actionable results and a simple implementation plan.